Military Monday is a daily blogging prompt used by many genealogy bloggers to help them post content on their sites. We all have ancestors who have served in the military. Military Monday is a place to post their images, stories and records of their service in various branches of the military. Clement May is my 3rd cousin 1x removed. His parents are John May and Mary Ellen Buckley. Our common ancestors are Thomas Buckley and Henrietta Mason, my 3x great grandparents. 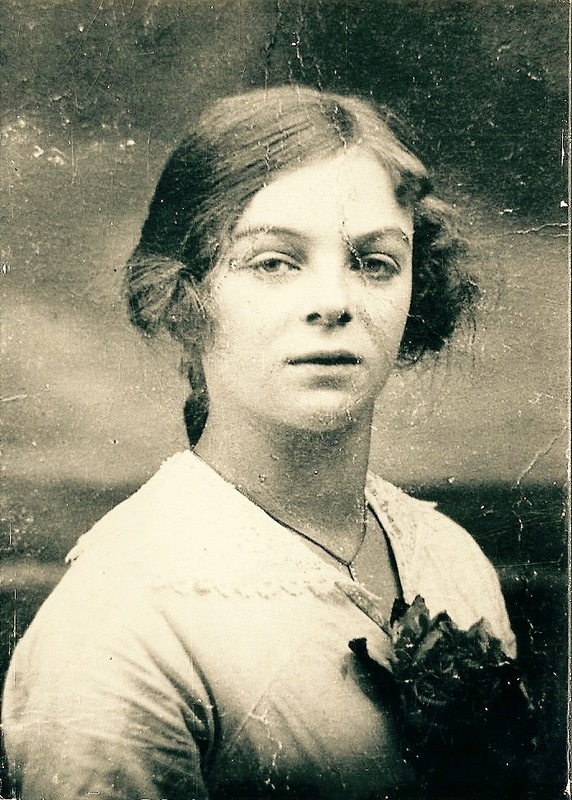 Clement was born sometime in Q2 of 1895 and was the fourth of at least ten children to John and Mary Ellen May. There doesn’t appear to be any surviving military service records for Clement. However I have been able to establish that he was a Private in the West Yorkshire (Prince of Wales Own) Regiment. He was in the 16th Battalion and his regimental service number was 32857. His entry on the Commonwealth War Graves Commission (CWGC) website shows that Clement died of wounds on 13 November 1916. I have tried to find out which battle he might have been in at the time of his death. The Battle of the Ancre seems to be the most likely. Clement is buried at the Couin British Cemetery in the Pas de Calais region of France. Couin Chateau was used as a divisional headquarters from 1915 to 1918. The British Cemetery was begun in May 1916 by the field ambulances of the 48th (South Midland) Division, and was used by units and field ambulances during the Battle of the Somme in 1916. It was closed at the end of January 1917 because further extension was not possible, and now contains 401 Commonwealth burials of the First World War and three German graves. The new British Cemetery was opened across the road and was used by field ambulances from January 1917 (with a long interval in 1917-18) to the end of the war. One grave was moved there after the Armistice from a cemetery at Coigneux. It now contains 360 Commonwealth burials of the First World War and two German graves. Both cemeteries were designed by Sir Reginald Blomfield. 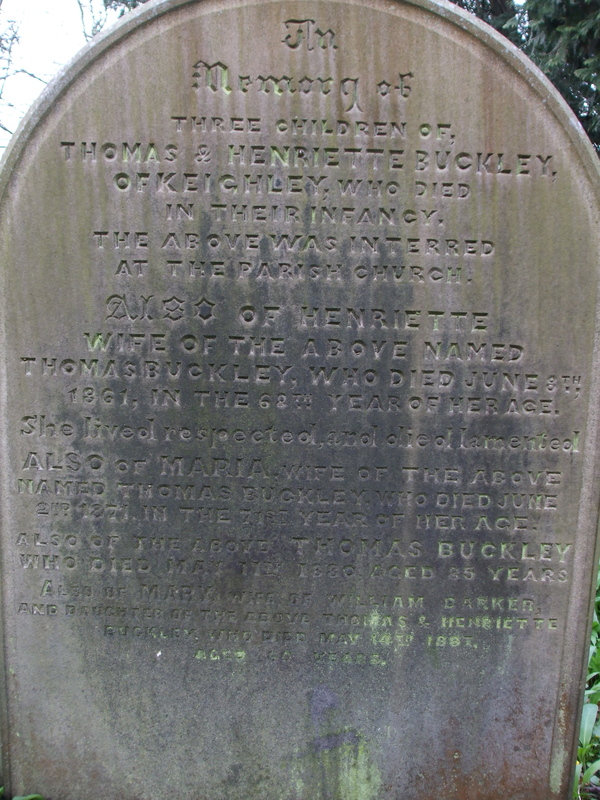 1880 … Thomas Buckley died in Keighley, West Yorkshire. He is my 3x great grandfather. This gravestone is in Utley Cemetery, Keighley, West Yorkshire. It is grave number 169 in unconsecrated ground in Section B of the cemetery. I have only just acquired the photograph today courtesy of a Bradford City Council bereavement services officer. I bought a copy of the National Burial Index at a family history fair last weekend and did a bit of searching. I found some ancestors buried at Utley Cemetery and emailed Bradford Council for any information such as plot numbers or a map. To my total surprise and gratitude they sent me a reply today about the people I identified plus other related ancestors – and photographs of the headstones. So a huge thanks for a superb service. I have replied and expressed my thanks. The plot was bought by Thomas Buckley, my 3x great grandfather. The grave is the resting place of Thomas (1795-1880); his first wife Henrietta Mason (1794-1861); their daughter Mary Barker (1826-1887); and Thomas’s second wife Maria Hindle (1800-1871). Much of this information is new to me as a result of receiving the photograph and doing a bit of digging this afternoon. For instance I didn’t know that Thomas and Henrietta had three children who died in infancy. I didn’t know that Thomas had married again after Henrietta died. I discovered this afternoon that he married Maria Hindle in Q3 1866. When I checked the 1871 census again I noticed that Thomas is shown as married but no wife is there – I hadn’t picked this up before. So I searched for Maria Buckley and found her as an inmate in the Union House. There is no indication in the census return that she was either deaf-and-dumb, or blind, or a lunatic or an imbecile or an idiot. However, the 1871 census was taken on 2nd / 3rd April and Maria died just two months later on 2nd June. So I do wonder if she was so poorly that Thomas couldn’t look after her or if there was some other reason why she would be in the Union House. I need to take a closer look at Thomas and his family and perhaps do an Ancestor Profile post in the future. 1861, IN THE 68TH YEAR OF HER AGE.